Now you can buy CDs from the store! Currently all titles are discounted! Cow! 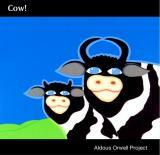 is an album of Folk-Noire by Sam's Aldous Orwell Project about the politic of our time. It is a musical romp through the prickly pastures of power-addiction, political tyranny and personal freedom. It is also good, fun music. Most of the album was recorded in 3 days in San Miguel de Allende, Mexico with Mexican, Cuban, Canadian and American musicians all of whom bring something personal to the themes in the tunes. Featuring: Gabriel Hernandez (Irakere), Willie Royale (Willie & Lobo) and Bobby Kapp. Includes the songs 'Nuclear Waltz', 'They Say', 'The Great Dictator' and 'My Best Prayer' (aka. Made of Love). FFM has finally recorded its long awaited studio album. 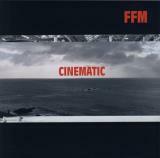 Cinematic includes new versions of several of the songs on FFM Live Plus! and a batch of new tunes. Joined by smokin' rhythm section Pat Steward and Doug Elliott (The Odds), and the great Bill Sample, Friedman, Fortin and Masich continue exploring the fusion of their three very distinctive styles. 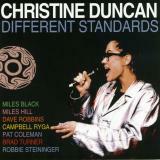 Includes the songs 'Martha Stewart', 'Carry Me Down', 'Fall Down' and Joni Mitchell�s 'Case of You'. - 2005 S. Masich, M. Friedman, M.J. Fortin. This self-titled album comes from one of the quirkiest duos north of Mexico City. Singer-songwriter Sam Masich joins forces with legendary jazz drummer and vocalist Bobby Kapp for an off-the-top, off-the-wall free for all. 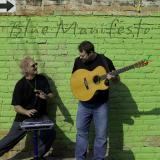 Masich and Kapp accompany their vocal stylings with acoustic guitar and synthesized hand percussion to come up with some completely unique first and second material. Includes the songs Salt Sorrow, Blue Manifesto of Art Over Love, Phone Booth and a new version of Chain of Loneliness. Sam Masich and Christine Duncan performed their unique duo act in Canada, the USA and Germany through the mid to late 90�s. Recorded in studio and live at the South Hill Candy Shop before it burned down in 1999, Why It Happens captures the chemistry that brought so many audiences to their feet. Sam's first solo album featuring songs Pictures of Elvis, Portable Dragon and Chain of Loneliness. Hot, hot band including Michael Creber (k.d. Lang), Hugh MacMillan (Spirit of the West) and others. 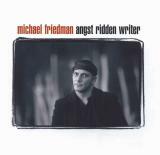 about Sam and Michael:Michael Friedman and I have been collaborating musically since 1995. When working together, Michael generally writes the music and then I supply the lyric. The way Michael sings, plays and composes always changes the writing process for me, taking me into new creative spaces that help me to stretch as an artist. Recently a good number of our collaborations have been arranged for accompaniment by a 60 piece orchestra. Hopefully we will be able to record and release some of this work in the future. 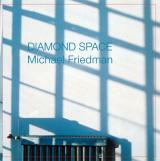 Lyrical, visceral and spare, Diamond Space is Sam's latest musical collaboration with Canadian vocalist/guitarist Michael Friedman. Belaying influences which range from Canadian to Eastern Bloc folk, Friedman's decidedly compositional guitar style puts him squarely in the company of such innovators as Don Ross and Michael Hedges. The Diamond Space song cycle includes pieces like Vulture Culture, Young Soldier, Golden Rose and Bridge of Jessica, strong statements about the human condition. This disc resulted from Sam and Michael's first wave of collaborations. 'Impeccable production - nothing overt - gentle but deep. Love in the Kitchen is delicious." Definitely one of the most successful SamSongs projects, Christine takes some of Sam�s best writing to a new level with a great band led by Miles Black and featuring such greats as Campbell Ryga and Brad Turner. Songs include, Why So Blue?, Indifferently, Poor Sad Boy and others. 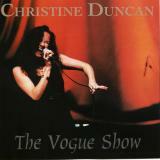 This fabulous concert album is one of few live jazz recordings documenting Vancouver vocal sensation Christine Duncan in the mid-90s before her move to Toronto and the avant-garde music scene. An excellent band with special guests Bob Murphy and the late, great Lynton Garner. 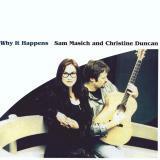 Sam Masich and Christine Duncan performed their unique duo act in Canada, the USA and Germany through the mid to late 90s. Recorded in studio and live at the South Hill Candy Shop before it burned down in 1999, Why It Happens captures the chemistry that brought so many audiences to their feet. A five octave, high octane wonder, Christine Duncan has established herself as one of Canada's hottest and most versatile vocalists. A critically acclaimed concert with a 17 piece jazz orchestra set in the majestic Christ Church Cathedral, provides a captivating backdrop for a compelling one hour documentary-portrait of the irrepressible Ms. Duncan. Coming Home gives us a glimpse into Christine's gospel roots and her unique sense of music, capturing an important musical moment in the life of one of Canada's unique vocal talents. Includes Sam's Why So Blue? One hour TV documentary special. DVD. 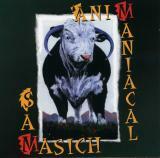 3 solo CDs: AniManiacal (1995), Cow! (2006) Luck Time (2009). Critics: AniManiacal: 'a mini-masterpiece'; Cow! music for advanced listeners'. Sam was the main lyricist on Michael Friedman's last two discs: Angst Ridden Writer (1998) & Diamond Space (2006). In the 90s Sam worked extensively with vocalist Christine Duncan producing 3 albums; Different Standards (1997), The Vogue Show (1997) and Why It Happens (1998).